Julia Child was a beloved American icon who pioneered an entire genre of cooking shows and taught a generation of food lovers that cooking can be easy and enjoyable. You can honor this pioneer by cooking a recipe, watching any of the hundreds episodes of her classic shows, reading tributes from celebrity chefs, and more. Bon appetit! Think You Know Everything About Julia Child? 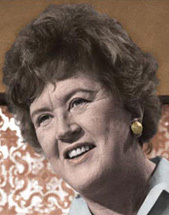 Which “Julia Child” Are You? Take the Quiz!